The people in charge at The New York Times Co. are all about transparency -- except when they're not. The memo -- headlined "On the Record" -- was billed as the first in a series meant to shed light on the inner workings of the Times co. "[G]iven all the speculation and incorrect information that has been reported about our Company, we think it is important to create a regular letter written so that you get the facts directly from us -- on the record," wrote Sulzberger and Robinson. "Future letters will discuss financial transactions, advertising, circulation, costs and the digital challenges we face as well as other issues as they arise." A regular update on advertising, circulation and financial matters -- what a great idea! Sort of like the monthly reports the Times Co. used to issue up until last December, when it stopped because the news became too unrelentingly bad. Of course, Times Co. employees, unlike outside reporters and analysts, won't be able to use the updates as fodder for stories about how badly the company is faring. 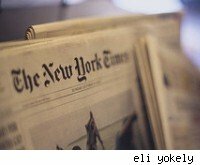 The Times Co. seems to be stepping up its efforts to control its image lately: Robinson made the same complaint about negative and inaccurate coverage to MarketWatch columnist Jon Friedman this week, and executive editor Bill Keller has been on something like an all-out publicity blitz for the last few weeks, as the Observer has noted.